The OUYE - sound familiar? Time to play a game. It's called "Find some part of this console that isn't infringing on someone else's copyright." Pro tip: you can't. Because, though China's had some pretty incredible knock-offs, this PS4-Xbox One mashup is easily one of the boldest. The console, called the OUYE (oh yeah, that's right) is currently being funded on a Chinese website and recently popped up on NeoGAF. Look familiar? As if the theft of the PS4's slanted design wasn't blatant enough, the creators decided to add the Xbox One's grill. Oh, and the controller is pretty much just the Xbox One gamepad, albeit for a few changes to the location of the centre buttons. But despite its explicit inspirations, this looks to be little more than a glorified Android console. 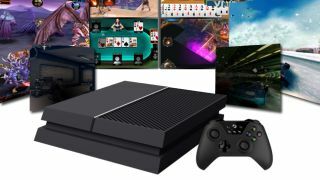 Considering China recently ended its 15-year ban on gaming consoles, we imagine Sony and Microsoft might have something to say about the OUYE. On a side note, here's another game for you. It's called "Is the guy on the right cheering, or angry because he didn't get to play?"